Cassandra Edwards has got to be one of the all-time-great narrators: her voice is dry and mean and hilarious. And I don't think my twin sister will be too offended if I say that I loved its refreshingly unsentimental and unsensational portrayal of a woman with a twin. Cassandra reminded me a lot of myself, but even if the circumstances of your life don't resemble hers quite so neatly, I think it's hard not to love her as a character. Cassandra Edwards is a graduate student at Berkeley: gay, brilliant, nerve-wracked, miserable. At the beginning of this novel, she drives back to her family ranch in the foothills of the Sierras to attend the wedding of her identical twin, Judith, to a nice young doctor from Connecticut. Cassandra, however, is hell-bent on sabotaging the wedding. Dorothy Baker's entrancing tragicomic novella follows an unpredictable course of events in which her heroine appears variously as conniving, self-aware, pitiful, frenzied, absurd, and heartbroken—at once utterly impossible and tremendously sympathetic. Cassandra reckons with her complicated feelings about the sister who she feels owes it to her to be her alter ego; with her father, a brandy-soaked retired professor of philosophy; and with the ghost of her dead mother, as she struggles to come to terms with the only life she has. Dorothy Baker (1907-1968) was born in Missoula, Montana, in 1907 and raised in California. After graduating from UCLA, she traveled in France, where she began a novel and, in 1930, married the poet Howard Baker. The couple moved back to California, and Baker completed an MA in French, later teaching at a private school. After having a few short stories published, she turned to writing full time, despite, she would later claim, being "seriously hampered by an abject admiration for Ernest Hemingway." In 1938, she published "Young Man with a Horn," which was awarded the prestigious Houghton Mifflin Literary Fellowship Award. She received a Guggenheim Fellowship in 1942 and, the next year, published Trio, a novel whose frank portrayal of a lesbian relationship proved too scandalous for the times; Baker and her husband adapted the novel as a play in 1944, but it was quickly shut down because of protests. 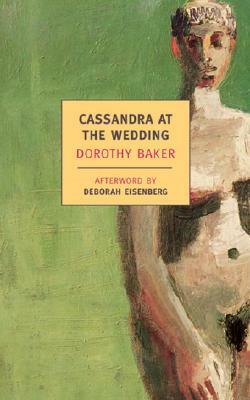 Her final novel, "Cassandra at the Wedding," examined the relationship between two exceptionally close sisters, whom Howard Baker asserted were based on both Baker herself and the couple's two daughters. Baker died in 1968 of cancer. Deborah Eisenberg is the author of four collections of short stories and a play, "Pastorale." She is the winner of the 2000 Rea Award for the Short Story, a Whiting Writers' Award, a Lannan Foundation Fellowship, and five O. Henry Awards. The Collected Stories of Deborah Eisenberg won the 2011 PEN/Faulkner Award. She lives in New York City.